Axios is yet another leftist website which promised "vital, trustworthy news and analysis" with "no bias" and "no nonsense" but has subsequently descended into parody. Saturday, Mike Allen and Jim VandeHei, two of the site's founders, posted "The Public Case Against Trump," allegedly a list of "known knowns" about "a damning tale that would sink most leaders." It's a colossal example of fake news. The "Axios Manifesto" pledges that it will "deliver the cleanest, smartest, most efficient and trust-worthy experience for readers and advertisers alike." "The Public Case Against Trump" delivers a hot mess which is a dumb waste of readers' time promoting a pack of falsehoods. Trump-Russia has yet to qualify as a Trump campaign or Trump administration "scandal." As of the article's Saturday evening post time, Kimberley Strassel's bombshell Wall Street Journal column credibly contending "that the FBI secretly had a person on the payroll who used his or her non-FBI credentials to interact in some capacity with the Trump campaign" — i.e., was "spying ... to infiltrate the Trump campaign" — had gone through two overnight news cycles. In other words, it had just become even more evident — with ample evidence going as far back as March 2017 — that "major" scandalous conduct occurred within the Obama administration's Department of Justice and FBI during and after the 2016 presidential election. The agenda-driven pair deliberately ignored this ever-growing, "damning" accumulation. It is "known" that Manafort's indictment has no direct link to collusion or obstruction, the potential long-shot charges against Trump. ... an already-tough portion of the Republican platform dealing with Russia was strengthened, not weakened, at the GOP convention. ... with Trump's approval, the platform was made tougher with language pledging ongoing and possibly increased sanctions. The Associated Press, New York Times, and others have acknowledged that only 4 of 17 agencies reached the conclusion, while several center-right outlets have found that the related report was "rigged", i.e., not subjected to normal selection and review procedures. The Axios pair's remaining bullet points are also decidedly non-compelling, and their post utterly fails to present a "public case against Trump." But hey, it has a nice clickbait headline. 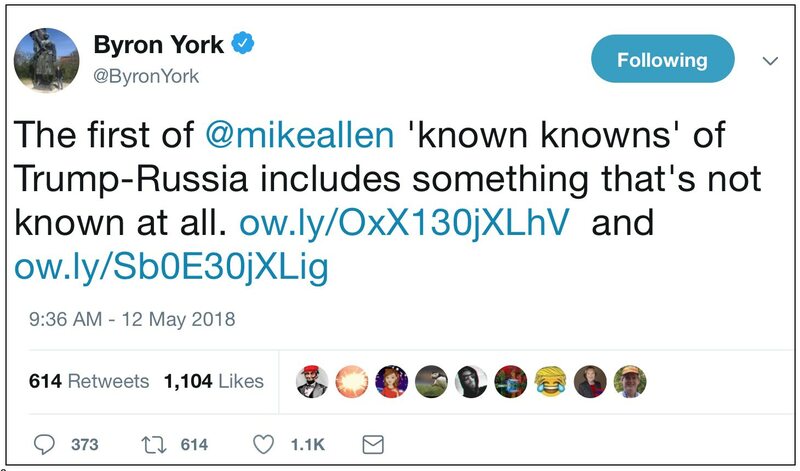 Sunday, Powerline's Scott Johnson employed the "smart brevity" which Axios claims to possess in a succinct statement: "Allen and VandeHei have coughed up a shockingly crappy piece of work." If this is the best two founders can produce, why should readers pay any attention to Axios?